Happy Tuesday, it's time for a tutorial! 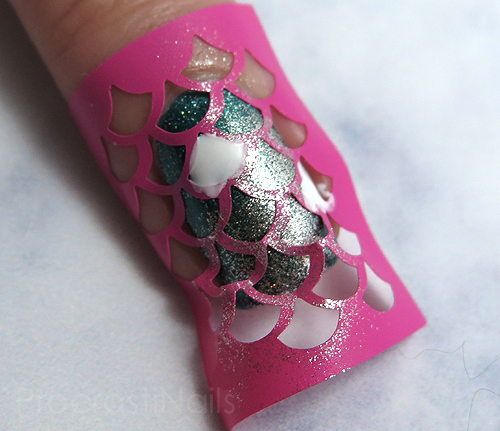 Sometimes you just wanna look like a mermaid but don't have the time for mermaid hair or the money for a mermaid tail, so why not make your nails into mermaid perfection so you can enjoy the same feeling? :) Don't know how? 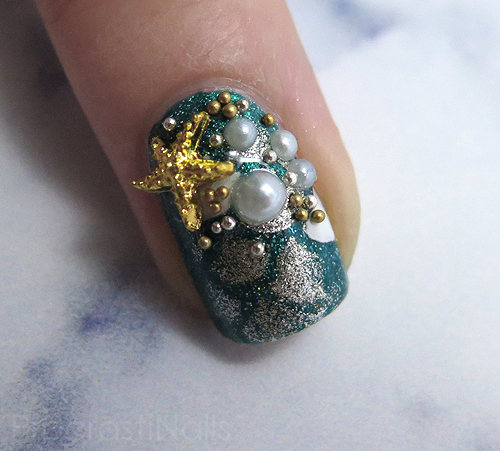 Lucky for you, I have a tutorial to show you how! You will also need a top coat which I once again forgot to include in my materials flat lay... Argh! Step 1: Apply two coats of your base coat (I used Julep Dominique) and make sure it is completely dry before you move on. Step 2: Is your base completely dry? Are you sure? 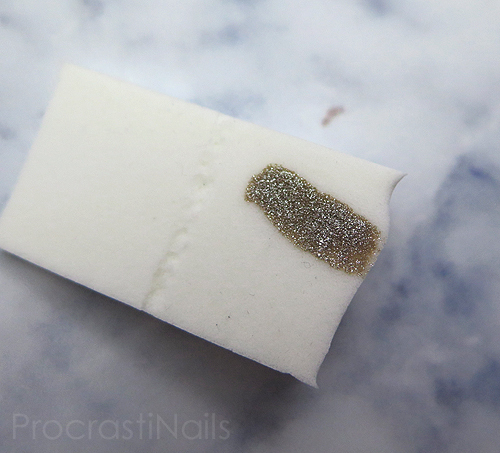 You're going to need to be sure, or you will mess this step up... Once your base is completely dry you can peel off and apply your decal, making sure to press down around the edges so the polish won't seep under when you apply it. 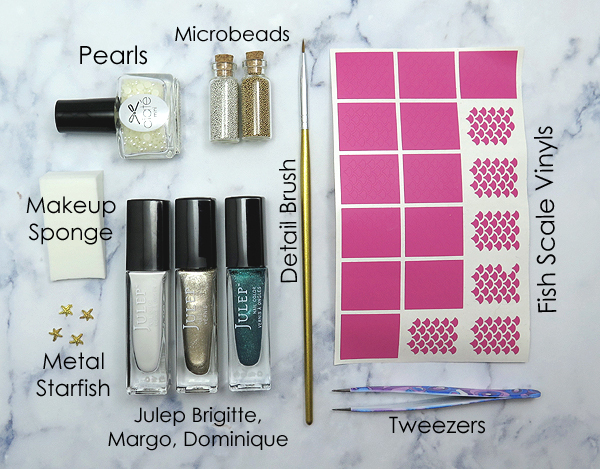 Step 3: Apply Julep Margo to a section of your clean makeup sponge. Step 4: Daub on your gold polish over the vinyl. 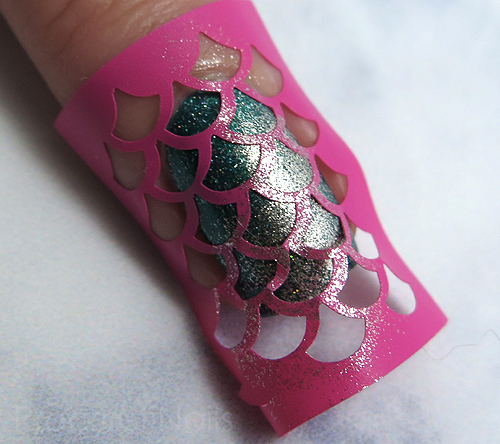 You don't want to cover the whole nail so just choose a section and press a few times, repeating step 3 and 4 a couple times if you want more coverage in the same area. It's supposed to be a bit random/messy so don't worry about fully filling in the scales. 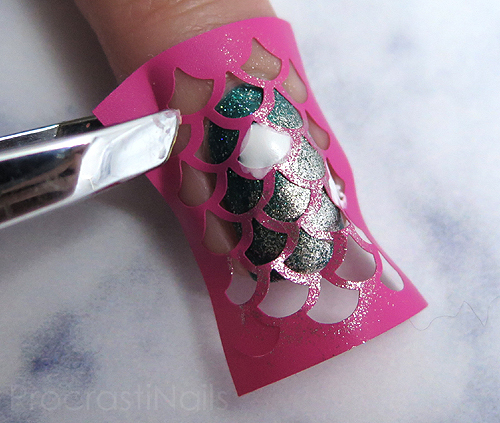 Step 5: Use your details brush and Julep Brigitte to fill in a couple scales through the vinyl. Try to choose ones that are well pressed down so the polish doesn't seep under the vinyl! Step 6: Carefully remove your vinyl with tweezers. You'll have the best result if you do this before the white polish dries. 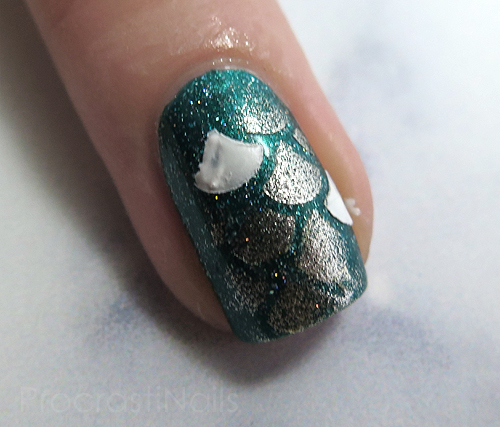 Step 7: Clean up any polish that seeped under the decal, add more polish with a detail brush to the scales if there are bare patches you dislike, and clean up around the cuticle! Step 8: Apply a thick layer of top coat and while it's still wet randomly place your embellishments around the nail with your tweezers. 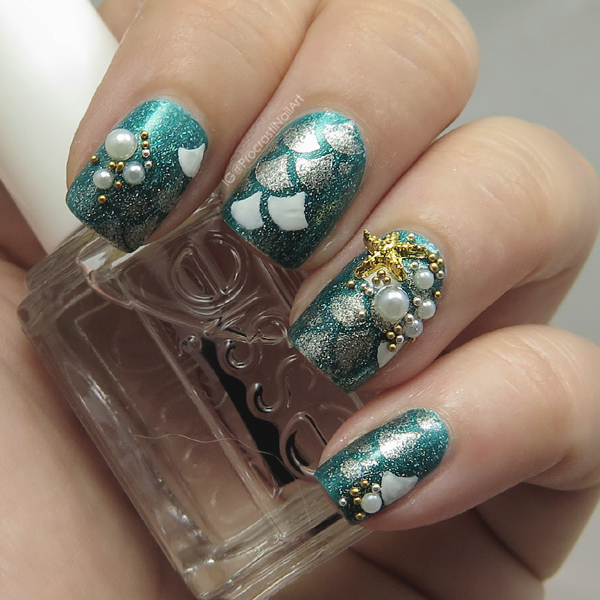 It's easiest if you have all your beads and pearls and such in a small dish before you apply your top coat, so that you can work quickly. 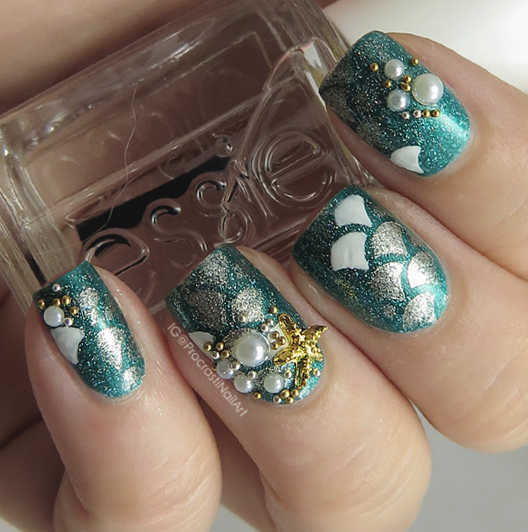 If you want this look to last longer use nail glue instead of top coat to stick the embellishments, and use a layer of top coat on the nail and let it fully dry before you apply the glue. And that's it! 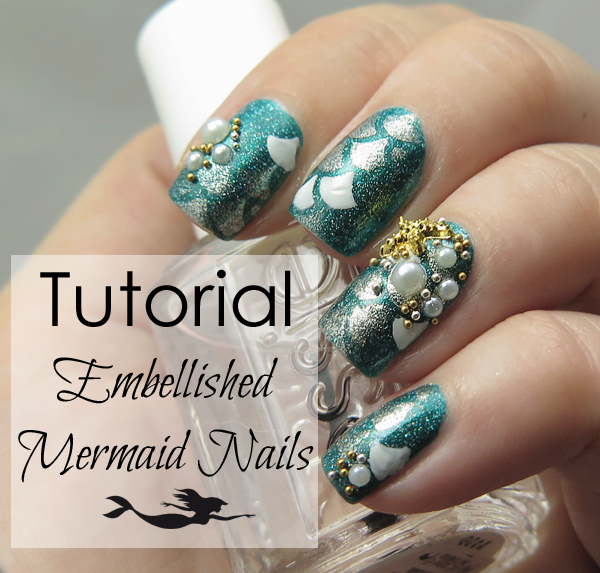 Now you have gorgeously aquatic and treasure-encrusted mermaid nails! I was surprised at how quick it was to put this look together, and I love the contrasts of the few white scales off the base! Sponging on colour over your vinyls helps to prevent the polish from seeping under which is something I often forget. 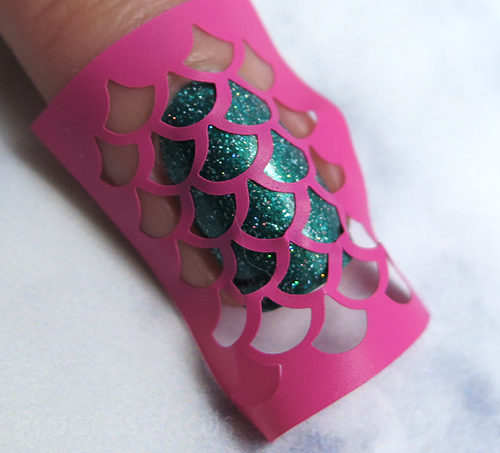 What do you think, is this a mani you would rock to fulfill all your mermaid dreams? ;) Let me know! 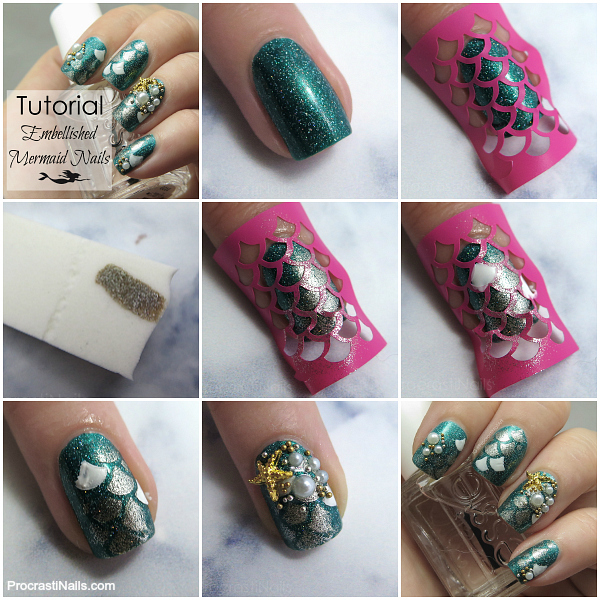 I love seeing mermaid manicures and yours is stunning! I am jealous that you can wear the 3D stuff. I'm always envious when I see such perfectly placed little pearls and beads. If I try something like this it just looks like a mess! I can't put down in words how much I love your embellishments placement! It's incredible! 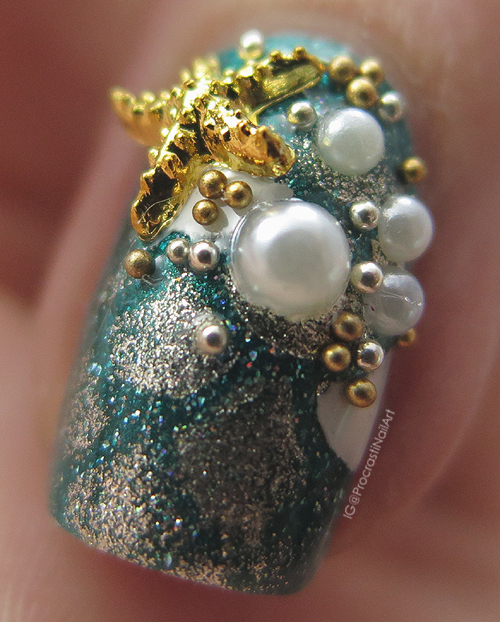 This has to one of the best mermaid manis I've seen. 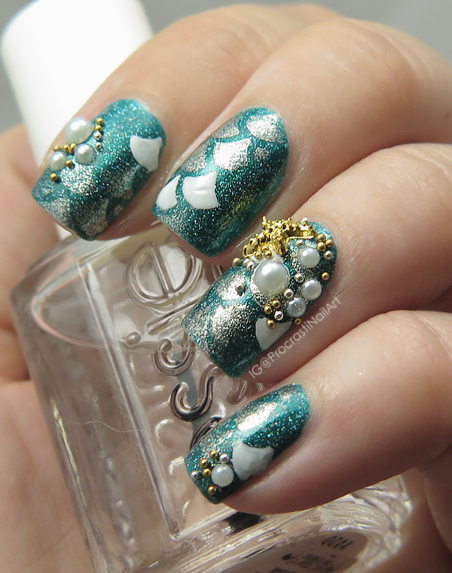 Those embellishments are so pretty! Beautifully done! It isn't gaudy. You had such a gentle hand in perfectly placing each stud. I love everything about this.